Heat oven to 350°F. Grease bottom only of 9x5-inch loaf pan with shortening or cooking spray. Place cereal in resealable food-storage plastic bag; seal bag and crush with rolling pin or meat mallet (or crush in food processor). Set aside. In large bowl, mash carrots with fork. With electric mixer on low speed, beat in reserved carrot liquid, lemon peel, lemon juice, oil and eggs until blended. Beat in flour, sugar, baking powder, pumpkin pie spice, baking soda and salt until blended. Stir in crushed cereal and walnuts. Spoon batter into pan. Bake about 1 hour 10 minutes or until toothpick inserted in center comes out clean. Cool 15 minutes; remove from pan to cooling rack. Cool completely, about 1 hour, before slicing. Grease only the bottoms of loaf pans for quick breads. Ungreased sides allow the batter to cling while rising during baking, which helps form a gently rounded top. 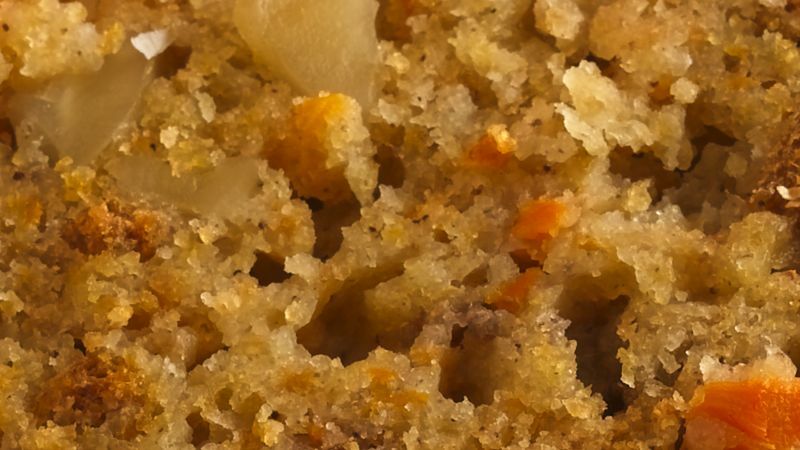 If sides are greased, the edges of the loaf may have ridges.